Since 2009, the federal TIGER program has helped communities of all sizes realize the ambitious plans for their communities through small, competitive grants for the smartest projects. As one of the few ways communities can directly access federal transportation dollars, demand has been through the roof. 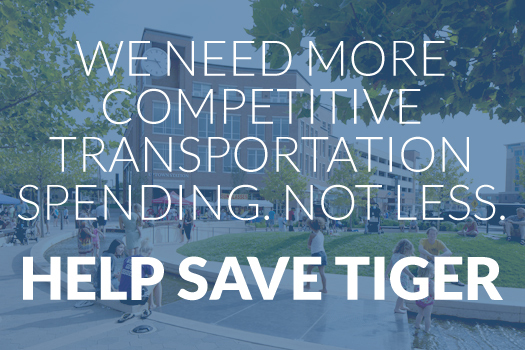 Unfortunately, in the just-released proposal for a new long-term transportation bill, the Senate Commerce Committee has decided to entirely scrap the oversubscribed and woefully underfunded TIGER program that has directed $4 billion since 2009 into smart, ready-to-go homegrown transportation projects with a high return on investment. Can you send a message right now to your Senators and urge them to preserve TIGER? The Senate Commerce Committee is marking up the bill on Wednesday morning (7/15), so there’s not a moment to lose!